The 8 hypothetical Transneptunians of Uranian Astrology (TNP) are called "planets" for historical reasons. It started as an astrological research project of Alfred Witte, where he tried to discover the orbits of unknown planets. However, it is more unlikely that new observed planetary bodies will obtain the status of a planet, today. So the usage of the title “Planet” for our hypothetical bodies will be not the state of the art, today. One reason is the new category of Dwarf Planets and the new definition of the "International Astronomical Union" about planets. The other reason is, that hypothetical astrological bodies were not yet confirmed by science, today. 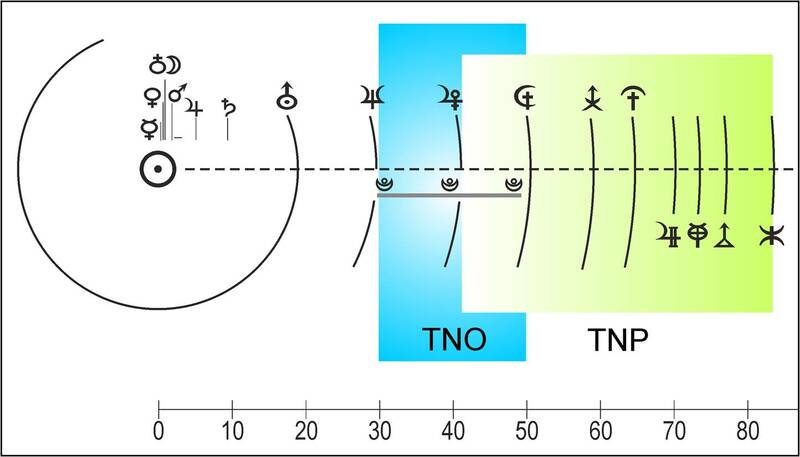 For a few years, the term "Transneptunian Objects" (TNO) is used for a group of bodies in the Kupier Belt region. These objects are located beyond the Neptune with a distance between 30-50 astronomical units to the sun. At the moment, the "International Astronomical Union" published a list of more than 2400 TNOs. For Uranian Astrology it is important to distinguish between hypothetical Transneptunians (TNP) and de facto Transneptunians (TNO), because only the Transneptunian "Cupido" is located in the Kupier Belt area. The hypothetical Transneptunians have solar distances with a larger range between 41-84 astronomical units to the sun, and both ranges are overlapping, see next image. The eccentricities of Sieggruens Transneptunians are lacking, which in fact seems to be unrealistic. However, so far the value of eccentricity is also been missing in total of 126 TNOs. This simply means that astronomers need to work with unknown or very low eccentricities, too. Hanna Opitz and Roberto Leonardi from Brazil wanted to find out what midpoints and planetary pictures are related to each profession/ vocation. So they created a software to calculate this. 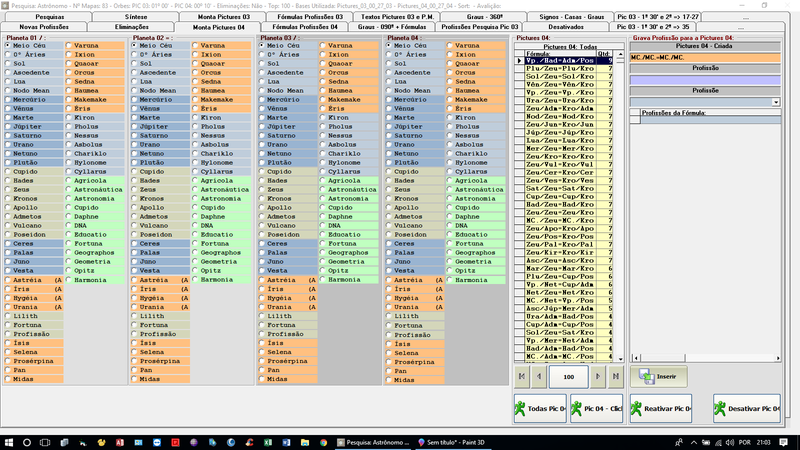 They are researching with 68 planets/ asteroids to confirm the vocacional midpoints and planetary pictures that already exist in Uranian Astrology and discover others. The idea is also to understand the meaning of new planets/ asteroids, based on the profession in which they will appear. The sofware is ready, and now they need help with data. If you are going to be at UAC 2018 in Chicago, you can meet Hanna there, she will try to make contacts and find out who can help them with data. At 20th of May 2007, in The Hague, Netherlands, friends from Italy, USA, Netherlands and Germany, discuss the founding of a new international network. As result the IUF was founded by seven friends: Dr. Lietta Catoni, Tiziana Ghirardini, Meira B. Epstein, Maria Kay Simms, Francine Rasenberg, Udo Rudolph† and Michael Feist. By the way, the meeting took place in the Pizzeria Vesuvio where we had a great dinner. The bill still exist, where at the back page all founders signed our "founding document". Today the board is presented by the IUF-Core which includes all founders and additional core-members from USA, Thailand and Turkey: Liane Thomas Wade, Nona Gwynn Press, Dr. Winai Ouypornprasert, and Neslihan Ayanoglu. The anniversary date mark the founding, but actually the story started already in 2005 with the 25th anniversary of the Uranian Society (New York) and the first Conference in Bologna, Italy, in 2006. Between 2008-2014 we had great conferences in Riga, Hamburg, New York, Bangkok and Istanbul. Indeed, the last years we had no conferences, but we are all still in contact in many different ways. A new conference will coming up in future, this will be sure.